Facts about Melampodium Plants, "Scientific name for Melampodium Plant is Melampodium paludosum". 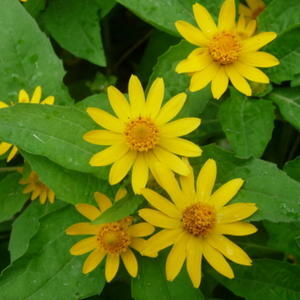 It is a genus of flowering plants which comes from the sunflower family known as the Asteraceae. The Melampodium Plant exist in thirty nine different species and is native to subtropical to tropical regions including the Caribbean, California, South America, Southwestern United States, Florida and Central America. Majority of the Melampodium Plant have been grown in Mexico, five grown in the United States to the South western areas and three of the species in Brazil and Colombia. The genus has a variety of species including perennials and annuals with less or more vigorous growth. The Melampodium Plant grows reaching a height on average of about 3 feet (1 meter) eventually falling over upon maturity. The Melampodium Plant produces green, serrate foliages with oblong-shaped leaves which come in several different colors of grey-green to bright green. The opposite leaves grow about 3/4 to 2 inches (two to five centimeters) long and are narrow. The Melampodium Plant usually produces solitary daisy-like flowers, florets, with dark orange or yellow centers and lighter rays developing one inch (2.5 cm) wide and twelve to twenty four inches (30.4 to 60.9 cm) long. The Melampodium Plant has eight to ten broad functionally staminate disc florets with the terminal flower heads growing approximately 1 1/8 inches (three centimetes) in diameter producing a continuous display of various colors including cream, white and yellow. The flowers fade upon maturity. However, the stems usually branch to produce new flowers. The Melampodium Plant flowers are pollinated to produce several seed-like fruits. The Melampodium Plant can be best grown in evenly moist to well-drained average soils and in full sun. The Melampodium Plant requires consistent moisture. However, it can establish in soils located slightly on the dry areas or rocky soils in desert areas. The Melampodium Plant can tolerate dry weather conditions including hot humid summer weathers. The seeds can be established six to eight weeks before the last frost and then planted after the last frost date in order to achieve blooms on earlier dates of its growing seasons. The Melampodium Plant can be grown singly in containers or small gardens for ornamental purposes.